Cerion » Blog » Is Growth Merely a By-Product of Successful and Profitable Business Operations? When PMI conference volunteers were asked to pitch for themes for the coming conference in 2018, “Growth” brought the most enthusiastic nods among the peer group. When growth is scrutinized from Project business and strategy view, it can be understood either as organic or non-organic growth. However, there are differences in how these are perceived in business context. For some, organic growth can mean new service and products done with current knowledge and resource base, whereas for others this is non-organic growth, which is sought through new products and services, new markets, and where it is acquired from new resources, innovations, and company acquisitions. Some may think that organic growth concentrates purely on productivity, that is achieved through: efficiency, rationalization, continuous improvement and organization restructuring. In the end productivity is achieved mostly with technology and less with education (or in other words from investments to human capital), resources (recruitments, sales and marketing) and service demand. Growth can also be seen merely as a by-product of successful and profitable business operations, which can be structurally planned and improved long-term. It can be argued that both profitability and growth are impacted by the same forces, but sustainable growth can be only achieved by renewal. Furthermore, we do not operate in a stable or even predictable business environment. On the contrary, a rapid development of technology and continuously changing operating environment makes business planning and forecasting nearly impossible. How to support both traditional and modern agile models (Bimodal)? There is a consensus amongst Project professionals that the bimodal target can be achieved through project and portfolio management, which aims to maximize the value of whole portfolio, to spread-out the portfolio risk and to meet strategic objectives. However, all project initiatives should not go through the same “mould”. Project business, should support both traditional and modern agile models (Bimodal) by identifying essential frameworks that fit the current digitalization transformation agenda. To achieve the Bimodal target state, strategic valued driven prioritization is required. Resources should be directed and mobilized to the right projects and programs. 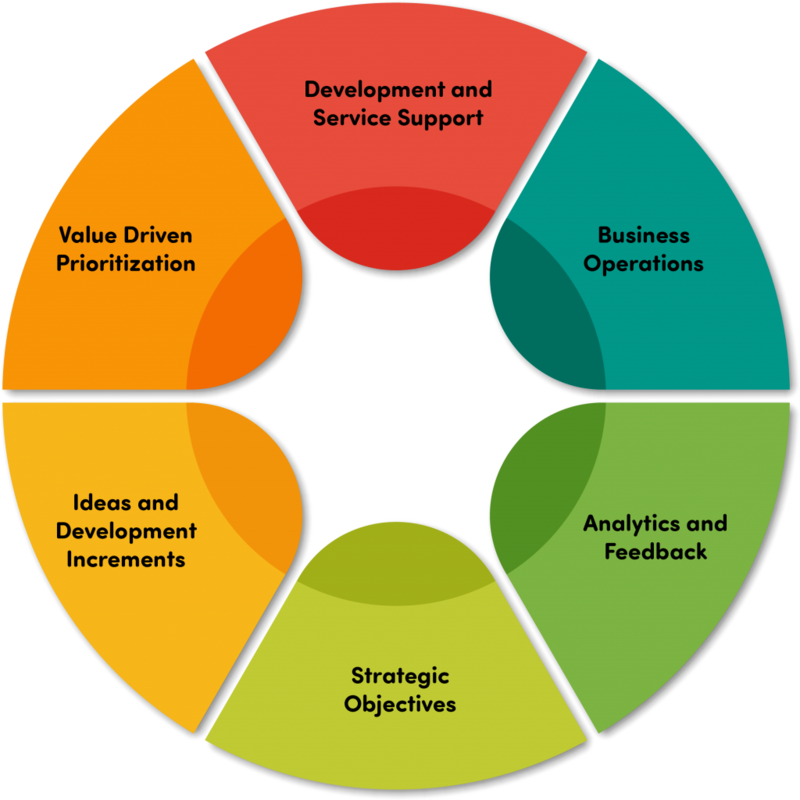 Supported with proper analytics, agile development and service management processes, where business information and ideas are transformed to knowledge and concrete initiatives, valuated and prioritized against strategic objectives, and thus continuing the “closed loop”. Growth it attained also through Managing resources, in this case human resource management, which aims to strengthen organisation capabilities as directed by the company strategy through salary and bonus schemes, personnel development and training, as well as with career planning and guidance. On a more individual level Growth is accomplished with leadership. While management is concentrated on tasks and activities, Leadership aims to excite and engage employees to the common goals and objectives, although in contemporary project business building organizational identity, learning, building trust and connection can seem as a taunting experience. Employee Engagement is built from motivation: work needs to be meaningful, there needs to be a purpose, a sense of belonging and connection, an opportunity to succeed and to be praised, and space for personal Growth. As a contrast, the modern hectic project business with multitasking and tight development schedules, do not provide a good backdrop for time management nor for employee wellbeing. Thus, the characteristics and competences of project managers leading strategic projects becomes essential. Project Management competence (social, organizational, technical and business), capabilities and experience to execute multicultural or transformation project, can be assured from relevant PMI and IPMA certifications, and from relevant references from prevailing business environments or areas. Organizational leadership is part of strategic competencies (leadership, knowledge management, exploiting time and learning orientation) together with knowledge management, where resource-, knowledge- and capability based views determine competitive advantage. Growth from a project organizations renewal capability view is measured from it’s ability to learn, continuously improve and innovate, where internal and external tacit and explicit information are exploited and integrated as part of the organization through knowledge transfer, communication and collaboration. This enables further value creation: new or enhanced product, services, processes, and frameworks. Project business further value creation opportunities can be found when examining the project life cycle from a larger angle. By including the exploration phase and supporting functions, such as organizational structures, project portfolio management, stakeholder management and collaboration, risk and quality management, and frameworks, when managing multicultural or transformation projects. Project life cycle management Services include Project Management Office and Project Auditing Services, where e.g. risk and quality management are thoroughly embedded as part of the project life cycle management, and where synergies are taken into consideration when planning projects and programs. As part of the exploration phase, architecture, technology and vendor selections and decisions affect indirectly customer-, future-, and infrastructure benefits thus enabling further value creation. Having the above in mind; I hope we can jointly discover “Growth” in the upcoming PMI event, 2018. Contributing to the programme, and a volunteer for the PMI 2018 event. Antti has led project change and project management, and he has extensive knowledge and expertise from multicultural projects in various roles such as Project Manager, Subject Matter Expert, Product Owner and Solution Arhitect. Antti believes that knowledge management is an essential part of project business, where projects should be value driven, led with strategic objectives and achieve concrete business benefits.